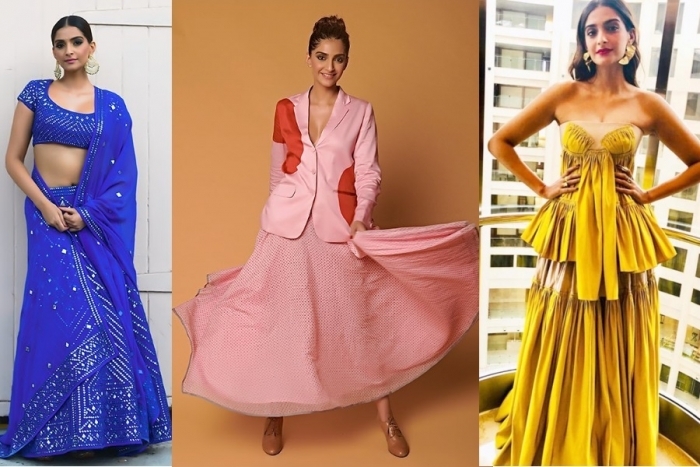 Promotions for VDW are in full swing for Ms. Kapoor who sported two looks on Saturday for interviews, first in a Rajesh Pratap Singh pink look and then in a blue Abu Jani Sandeep Khosla lehenga. A L’Oreal event on Friday saw her in a gold Toni Maticevski gown but while I loved the color, not a fan of that bust design. A girl with access to so many designers and clothes can do so much better, no? Loved the pink look. She looks so good in that. From Aisha to THIS? Fashion trajectory is abysmal. My favvvvv would be the yellow !! !